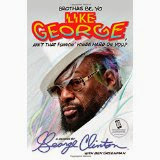 The long-awaited memoir from one of the greatest bandleaders, hit makers, and most influential pop artists of our time—known for over forty R&B hit singles—George Clinton of Parliament-Funkadelic. George Clinton began his musical career in New Jersey, where his obsession with doo-wop and R&B led to a barbershop quartet—literally, as Clinton and his friends also styled hair in the local shop—the way kids often got their musical start in the ’50s. But how many kids like that ended up playing to tens of thousands of rabid fans alongside a diaper-clad guitarist? How many of them commissioned a spaceship and landed it onstage during concerts? How many put their stamp on four decades of pop music, from the mind-expanding sixties to the hip-hop-dominated nineties and beyond? One of them. That’s how many. How George Clinton got from barbershop quartet to funk music megastar is a story for the ages. As a high school student he traveled to New York City, where he absorbed all the trends in pop music, from traditional rhythm and blues to Motown, the Beatles, the Stones, and psychedelic rock, not to mention the formative funk of James Brown and Sly Stone. By the dawn of the seventies, he had emerged as the leader of a wildly creative musical movement composed mainly of two bands—Parliament and Funkadelic. And by the bicentennial, Clinton and his P-Funk empire were dominating the soul charts as well as the pop charts. He was an artistic visionary, visual icon, merry prankster, absurdist philosopher, and savvy businessmen, all rolled into one. He was like no one else in pop music, before or since. Written with wit, humor, and candor, this memoir provides tremendous insight into America’s music industry as forever changed by Clinton’s massive talent. This is a story of a beloved global icon who dedicated himself to spreading the gospel of funk music.